Brit boffins have peeled back the covers of how Netflix has built its CDN, by requesting movies from all over the world and working out what the responses told them about the hosts. The research incidentally explains why the entertainment biz wants the Internet exchange (IXP) industry to trim its costs: in the USA, IXPs deliver around 1,600 Gbps of Netflix traffic. Netflix has talked up its global deployment, but hasn't gone public with the kind of detail the Queen Mary University of London researchers offer in this paper at Arxiv. The five researchers turned up servers in six continents and 233 individual locations, along the way turning up some surprises in traffic patterns. While nobody would doubt the assertion that the USA is still where the action is for Netflix traffic, the researchers reckon the number-two spot is held by Mexico, followed by the UK, Canada and Brazil. To get their data, the researchers started by firing off manual requests for videos, localising the requests using the Hola browser extension to work out the company's naming conventions (it's not surprising that Netflix is, as the paper says, “deterministic” in server naming: the alternative in a network that size would be chaos). Hence, iipv6_1-lagg0-c002.1.lhr005.bt.isp.nflxvideo.net and ipv4_1-lagg0-c020.1.lhr001.ix.nflxvideo.net told the researchers they were talking to an IPv6 server; “lagg0” is one of various names used to distinguish the type of network connection; “c002” says there are two servers in the location delivering the content; lhr001 identifies the nearest airport (in this case, London Heathrow); the ISP is BT (“bt.isp”); “ix” reveals that the Netflix location in question is inside an Internet exchange; and nflxvideo.net is the common domain for all servers. That structure made it feasible to use agents to automate the enumeration of the infrastructure. “We implemented a crawler, which generated DNS names following the pattern outlined above and attempted to resolve those generated domains names to IP addresses. The crawler was fed with lists of known countries, airport codes and ISPs. We curated these lists manually, consulting publicly available lists of countries and airport codes”, the paper continues. Where the Netflix servers are. 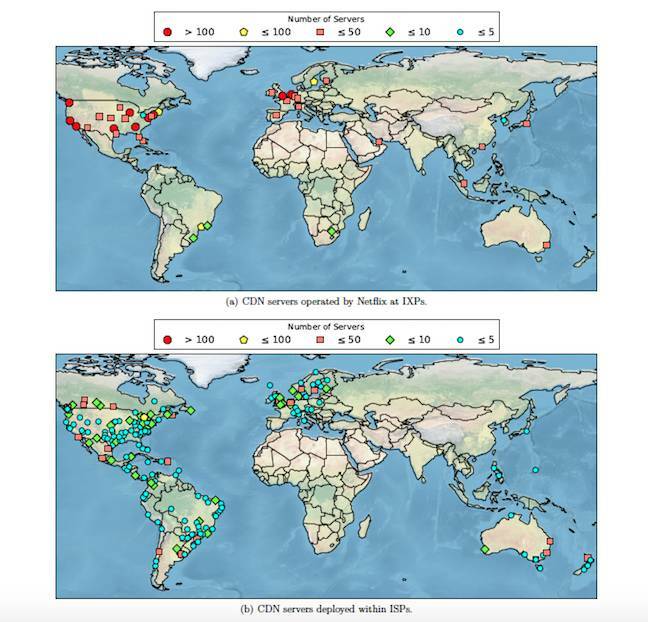 Since the researchers don't have access to Netflix's “real” flows, they estimated from each server by firing pings at each server, and “tracking the evolution of the ID values in the ICMP answers”. Since Netflix is a FreeBSD-everywhere, they write, the packet IDs serve as a handy (if approximate) proxy for traffic loads. Their results on a country-by-country basis are below.